In this section we present our themes on competitiveness related issues. Please contact the theme facilitator or us if you would like to join other researchers working on a particular theme. We are pleased to announce that we have several competitiveness related themes in place. By engaging faculty across all of CBS, the purpose of themes is to develop cross-disciplinary collaborations among dynamic groups of researchers engaging in important areas where they can work with competitiveness from different angles. Each theme is coordinated by a facilitator. The facilitators and CBS Competitiveness would like to hear from you, if you would like to become involved with the themes. Should you have any ideas for activities, comments or questions relating to any of the themes, you are more than welcome to contact us or the facilitator of the theme directly. The current global competitive environment with increasing focus on the provision of services is putting tremendous pressure on manufacturing companies. Mads Lebech, CEO, The Danish Industry Foundation says: “Danish companies are facing intensified global competition, not least from powerful emerging economies. This calls for innovation and new solutions, based on existing Danish strengths. Servitization, where manufacturing companies are selling services as part of their offering, can become a strategy for increasing financial margins for Danish industries”. This new 4-year CBS project financed by The Danish Industry Foundation expands on what was achieved during a pre-project during spring 2014. It explored and explained challenges that pushed for servitization, different forms of servitization, processes for developing servitization, and key challenges in implementing servitization. All is summarized in a free to download practical step-by-step handbook. Subsequently, a couple of companies started to develop their servitization concepts out of this. Professor Christer Karlsson of CBS: “Now the researchers will work closely with many Danish companies to develop value propositions and processes for implementing servitization, both in the short and long run. It will involve both large and small companies with varying types of core businesses, ranging from original equipment manufacturers to suppliers and sub-suppliers of components and materials”. The collaboration between researchers and companies take place within three themes: 1) Servitization as a global competitive strategic response - why embark on servitization? 2) Design and innovation for servitization – what is needed to realize servitization? 3) The processes of servitization transformation – how to implement servitization? Participating companies will gain from the increased direct servitization activities as well as the share of revenues generated through services as well as increased profitability. Several approaches are used to develop the skills of the companies to develop and implement servitization: 1) Mapping and knowledge sharing between companies, 2) Case studies in which the researchers explore servitization in the companies and participate in the development, 3) Action research in which the researcher is active in the company’s servitization process implementing the concepts and models from the theory of servitization, and 4) In-depth longitudinal field studies in which a researcher is embedded in servitization projects in the company. Dissemination activities are expected to reach 200 companies with around 15 case studies and one or more longitudinal field studies in addition to mapping and sharing knowledge of the experiences of servitization of Danish industry. In total the project is allocated a funding of 8.000.000 DKK for 4 years (October 2014 –2018). If you are interested in company cases, you can also download the case Brüel and Kjær - Expanding Markets Through Analytical Services and Solutions. This report considers the case of Brüel & Kjær and how it has sought to successfully develop highly complex analytical services and solutions alongside solution-based business models. It explores the opportunities and challenges encountered by the company in seeking to scale up these developments to certain areas of its business. The case is also available for your download to your ebook reader, tablet or smartphone free of charge. CBS takes an active part in the Manufacturing Academy of Denmark (MADE) and its membership is anchored in the CBS Competitiveness Platform. MADE - Manufacturing Academy of Denmark - is an independent association established in 2013 working to promote production in Denmark through research, innovation and education. MADE consists of 26 production companies, five universities, two institutes of technology and the Confederation of Danish Industry with support from The Danish Industry Foundation, Provincial Industry Employers' Association (PA) and the Copenhagen Industries Employers (IAK). In late 2013 MADE received a Strategic Platform for Innovation and Research grant, a so-called SPIR grant of DKK 64 million for production research from the Strategic Research and the Council for Technology and Innovation. The grant is co-funded by the following actors: DKK 88 million from businesses (in-kind and cash), DKK 21 million from The Danish Industry Foundation, IAK and PA ( in addition, DKK 8 million to establish the MADE Association), and DKK 10.5 million from the universities. The overall research framework therefore amounts to DKK 183.5 million over 5 years. Our contact person is Professor Torben Pedersen. Please contact Torben if you would like to know more about the MADE initiative. Researchers from CBS participating in the new big research collaboration, Manufacturing Academy of Denmark (MADE), which with 183.5 million DKK shall strengthen Danish production and competitiveness. More than one in five jobs in Danish manufacturing companies have disappeared, since the crisis began in 2008. It requires education, innovation and world-class research to innovate and streamline production, for manufacturing companies to compete successfully and create new jobs in Denmark. MADE is a new major collaboration between companies, universities and technology institutes in Denmark, which with 183.5 million DKK is to create a stronger research environment within production in Denmark over the next five years. Simultaneously the collaboration is to strengthen Danish manufacturing companies in order to reorganize production, to meet the demands of customers and competition. - The manufacturing industry is constantly under pressure by countries, where costs are lower than here. But it is not enough to have the goods produced more cheaply. The customers continuously have new demands, and that requires a fast and flexible production. - The purpose of CBS’ contribution to MADE is to formulate the future Danish production paradigm, that is, a paradigm for the retention and extension for production in Denmark, says Professor Torben Pedersen, SMG, who leads the CBS research under MADE. All the CBS researchers participating in the project, are part of the CBS Competitiveness Platform. Besides Torben Pedersen, it is the professors Christer Karlsson, OM and Thomas Ritter, SMG. DTU Management Engineering, Aalborg University and Force Technology are also a part of the research on the production paradigm of the future. Torben Pedersen emphasizes, that many Danish manufacturing companies across industries and size, face the same challenges, such as how to combine high efficiency with a willingness to take risks by introducing new ideas in production, or how to utilize the benefits of standardization without losing flexibility. There will be a large numbers of experiments in the involved companies. - The problem we are going to deal with, is interesting not only from Grundfos’ perspective but overall for the industry in Denmark, says Torben Buch Rasmussen, Technology Director at Grundfos, who is one of the partners in The Future Production Paradigm. - We are used to have students in the company, who, in a short period deals with different problems. But to focus over a long period of 4-5 years gives totally different perspectives to create a link between the practical and theoretical world. To have academic capabilities in the project will be new, that will be interesting to follow, he said. Besides Grundfos, the partners where there are projects, is Coloplast, NKT Photonics, TRESU and Haarup Maskinfabrik. CBS expects that this list be expanded with several companies, since the projects already have attracted much attention. Especially the small and medium-sized enterprises (SME) are in focus. 88 mio. DKK from the companies (in-kind and cash), 21 mio. DKK from The Danish Industry Foundation, The Copenhagen Industries Employers (IAK) and The Provincial Industry Employers' Association (PA) (additionally 8 mio. DKK for the establishment of MADE association), and 10.5 mio. DKK from the universities. The overall research framework is thereby 183.5 million DKK over 5 years. tp.smg@cbs.dk or telephone: +45 38152521. Human Capital Analytics Group (HCA) at CBS is a research theme within the CBS Competitiveness Platform. 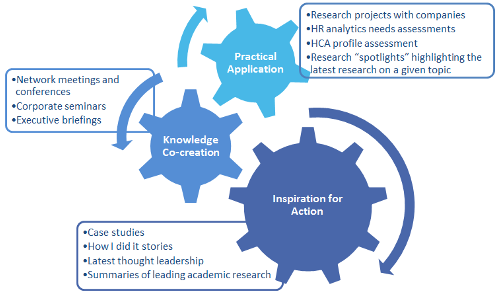 HCA is a non-for-profit organization, dedicated to making analytical human capital research accessible, comprehensible and to bring it closer to practice by co-creating and transferring knowledge to Danish companies and inspiring them to take action. To date, HCA has created a community of HR professionals and academics via LinkedIn (search for “Human Capital Analytics Group” on LinkedIn). Additionally, we have started publishing executive summaries of the key, most influential academic articles published in the top, international peer-reviewed journals (see: http://www.cbs.dk/en/research/cbs-research-projects/major-research-projects/human-capital-analytics/research-insights). We have also presented at several academic (e.g. Academy of Management) and practitioner-oriented conferences (e.g. NOCA’s Årsdag). Finally, we have facilitated corporate workshops on the topic of Human Capital Analytics, which have been extremely well-received by participants and companies. Fundamental to the success of this research theme is collaboration with external stakeholders (such as companies, NGOs, government institutions, and individual practitioners) on education, research, and knowledge dissemination. Projektet vil opbygge et dansk Big Data Big Business kompetencecenter. Formålet er at give indsigt i de muligheder, der ligger i at udnytte Big Data, herunder at skabe et mødested for virksomheder, der har data til rådighed, og virksomheder, der ønsker at tilegne sig ny data. Manglende tilstedeværelse af et neutralt interaktionssted for salg og køb af Big Data. En virksomhed har behov for at finde ud af, hvilke kompetencer den har og skal have, for at kunne trække værdi ud af digital forretningsudvikling. Kompetenceniveauet undersøges, og der udvikles et selvevalueringsværktøj, så virksomheder kan kortlægge eget kompetencebehov. I regi af projektet etableres endvidere et kompetencepanel, som kan rådgive virksomhederne og på den måde kompensere for de manglende kompetencer. Tyve virksomheder gennemgår et udviklingsforløb med afsæt i denne kortlægning. Virksomheder skal opnå kundeindsigt og omsætte denne indsigt til forretning. Projektet bidrager til udvikling af et customer discovery tool, der skal hjælpe virksomheden til at få en forståelse af, hvad der skaber værdi for kunden. 20 virksomheder gennemgår et interaktivt forløb, hvor de hvert kvartal mødes omkring en ny metode og tester anvendeligheden af denne i egen virksomhed. At udnytte mulighederne i Big Data afhænger i vid udstrækning af topledelsens forståelse for de scenarier, der tegner fremtidens konkurrencesituation. I nærværende indsats bygges der videre på ovenstående. Fem virksomheder vil i et tæt samarbejde mellem ledere og forskere ændre organisationen, så den kan frigøre mulighederne i Big Data. På baggrund heraf stilles en udviklingsdrejebog og værktøjer til rådighed for virksomhederne. Virksomheder har ifølge ansøger brug for et mødested, hvis de skal få indsigt i de nye muligheder der opstår, når forskellige typer af data kobles. Projektet etablerer en platform med realtime databaser, som ejere og brugere af Big Data kan benytte efter aftale og på kommercielle vilkår. Projektet vil herefter matche de virksomheder, der har Big Data, med de virksomheder, der kan trække værdi ud af disse data ved eksempelvis at anvende dem i egen forretning. Målet er at udvikle 10 konkrete forretningsprojekter. Effekten af projektet vil kunne måles på, at de involverede virksomheder vurderes. Målsætningen er en ekstra top- og bundlinjevækst på mellem 3 og 10 procent i projektets løbetid, samt at der bliver skabt værdi på en række andre målbare indikatorer. Udover den direkte effekt hos de involverede virksomheder, så forventes det at projektet munder ud i en række forskningsartikler. Undervejs i projektperioden afholdes der desuden både konferencer, undervisning og workshops. Projektet har udgivet en praksisguide, som kan downloades nedenfor.